Every dancer knows the importance of cross-training, of the idea of working to become a versatile, well-rounded mover. In terms of dance styles, a ballet dancer may cross-train by also studying modern, and a jazz dancer may cross-train by taking ballet. But what about the idea of classically-trained dancers cross-training with styles likes tango and west coast swing, and vice versa? That is the purpose of The International Partner Dance Intensive (TIPDI), a program that, for the past two summers in New York City, has offered a wide variety of partner dance styles, along with ballet and modern, for students and dancers of any interest, age and skill level to study. The idea is to teach technique of each of these styles, to encourage dancers to “cross-pollinate” for their overall artistry, and to do so in a fun, supportive environment. 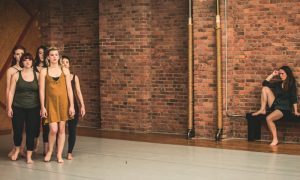 This spring and summer, TIPDI will host several workshops that hone in on a particular dance style or styles and allow dancers, specifically adults but also open to professional dancers, to study and even perform. TIPDI 2015 Workshop Series will kick off with “The TIPDI ‘Swouk and Zwestie’ Intensive”, to be held on Saturday, April 18, at NYC’s Shetler Studios. This workshop is geared to dancers ages 18 and older who have previous partner dance training. It focuses on west coast swing and zouk styles and how they can be combined on the dance floor. There are two tracks offered – one that covers west coast swing fundamentals and one that covers zouk fundamentals – and the workshop culminates with a “crossover lab”. Argentine tango instructors Daniela Pucci and Luis Bianchi will lead a series of tango technique classes this May. Photo by Laelia Milleri. On May 9, “TIPDI Presents Daniela and Luis Tango!” will be a series of tango technique classes, led by Argentine instructors Luis Bianchi and Daniela Pucci. The workshop is open to dancers of all skill levels, and both partner dancers and classical dancers. Other upcoming workshops include a “Ballet and Modern Boot Camp for Adults”, an “Afro-Haitian Performance Workshop”, a “Salsa On 2 Shines and Partnering Boot Camp” and more. Wilson says that for most of these workshops, some prior movement training is expected, although students do not need to have any experience in the exact style being taught. This gives adults a safe space to learn something new and meet many other types of dancers. “TIPDI classes are focused on technique,” Wilson adds. “We don’t teach long sequences or extended swaths of choreography. All of our instructors are invested in making you a better dancer, and that means addressing all of the deep technique points that separate the great dancers from everyone else. Enrollment has already begun for TIPDI’s first workshop, and all enrollment will be limited to ensure personal attention. Workshop fees vary from $60-290, depending on the length of the workshop and number of classes offered. Students may enroll in just particular parts of a workshop as well. More information on each workshop and how to enroll can be found at www.tipdi.com. Wilson is most looking forward to bringing together adult dancers from all over the globe, all who want to improve, learn something new, or discover something about themselves. Photo (top): TIPDI workshops are open to adult dancers and professionals who want to expand their range of styles. Photo courtesy of Wilco de Groot.